dedicatserver.ro Review 2019: Is dedicatserver.ro a Good Hosting? dedicatserver.ro is a web hosting vendor based in Romania. The hosting provider offers an array of web hosting solutions including dedicated servers, cloud VDS, VPS servers, shared hosting, and reseller hosting solutions. dedicatserver.ro is a web hosting provider that offers dedicated servers, cloud VDS, VPS servers, reseller hosting, and shared hosting solutions. The firm uses DDoS-protected servers housed in a data center located in Bucharest, Romania. At first glance, the dedicatserver.ro website looks like it is available in Romanian, German, English, and French. However, when you try to switch from the default language Romanian to German or French, the website switches to English. dedicatserver.ro’s hosting services are hosted in modern data centers located in Bucharest, Romania. The data centers are TIER III compliant and equipped with four mutually independent redundant power sources as well as fire and air conditioning systems. The servers run on a fully redundant network powered by enterprise-grade hardware from leading manufacturers such as IBM and Supermicro. This vendor’s cloud-based, LiteSpeed SSD servers all but guarantee faster loading speeds for all of the websites it hosts. This vendor’s hosting solutions use CloudLinux operating system. This, among other things, ensures clients’ websites remain independent of each other to reduce the spread of malware and viruses, as well as limit security breaches. The vendor also employs isolation protocols that ensure websites with high resource demands do not adversely affect others within the same server. dedicatserver.ro offers daily and weekly backups but does not guarantee the integrity of these backups. The vendor includes a free hosting package that comes with 5GB SSD disk space. dedicatserver.ro hosting solutions are extremely cheap. The plans come with flexible billing cycles that include monthly, quarterly, biannual, and annual subscriptions. The prices of the hosting plans are are listed in euros. The vendor’s hosting plans also include free installation and free DNS management. dedicatserver.ro has a 30-day money-back guarantee and an uptime guarantee of 99.99%. To contact dedicatserver.ro’s customer service, you can use telephone, email, or ticketing system. The hosting provider has not availed a live chat on its website. Its customer support team is said to be available 24/7 yet my email to them got no reply. With just a few articles and tutorials, this vendor’s knowledge base is pretty limited. dedicatserver.ro’s reasonably-priced hosting solutions make it an excellent fit for businesses of all sizes. What’s more, the vendor’s decision to invest in modern hosting infrastructure has played a significant role in making headway in the Romanian hosting market. 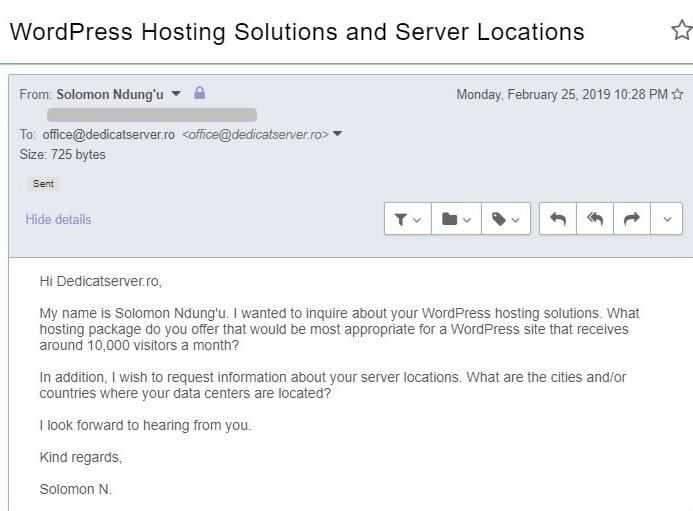 Its unresponsive support is, perhaps, a major area of concern that the vendor needs to look into if it is to continue its rise in the hosting business well beyond the Romanian borders. Wondering how dedicatserver.ro stacks up against other Web Hosting companies? Enter any other Web Hosting company and we will give you a side-by-side comparison.